Climate change. Economic inequality. Transgender rights. Coal. The future of our communities. These are some of the issues that divide our society. But what if, instead of sitting alone in front of our televisions or social media, stewing with frustration, we came together as a community to watch films on these issues and then engaged in thoughtful discussion of ideas and possibilities? Would we come up with new ideas? Would we learn from each other? Would we enjoy the social interaction and celebrate the bonds between neighbors and friends? Would we be inspired to action? 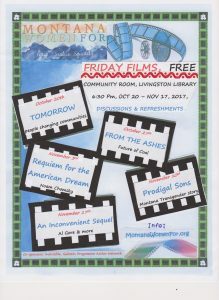 That is what Montana Women For is hoping will happen at their Friday Film Series beginning this week. Provocative documentary films will be shown Friday evenings at 6:30 pm at the Livingston Park County Public Library (228 W. Callender St in Livingston) from October 20 through November 17. After each film a discussion will take place. The film screenings are free and open to the public. Tomorrow – an award winning environmental documentary highlighting how bottom-up community action regarding food, energy, finance, democracy and education can have a meaningful impact toward positive outcomes. Paul Hawken says, “Without question, this is absolutely the best and most creative film on the future of humanity and the environment”. From the Ashes – captures Americans in communities across the country as they wrestle with the legacy of the coal industry, and what its future should be under the Trump administration. A compelling look at the lives and issues behind the “war on coal” “Heartbreaking and enlightening at the same time. A must-watch for everyone because we should all be in this together.” – Former U.S. Secretary of State John Kerry. Includes segment on Colstrip in Montana. Requiem for the American Dream – well-known social critic Noam Chomsky discusses how the concentration of wealth and power among a small elite has polarized American society and brought about the decline of the middle class. Prodigal Sons – in this documentary, filmmaker Kimberly Reed returns home to Helena, Montana, for her high school reunion, ready to reintroduce herself as a transgender woman who was co-captain of the football team and a winning quarterback, and hoping for reconciliation with her long estranged adopted brother Marc. An Inconvenient Sequel: Truth to Power – A decade after An Inconvenient Truth (2006) brought climate change into the heart of popular culture comes the follow-up that shows just how close we are to a real energy revolution. Stars: Al Gore, George W. Bush, John Kerry.